In Billund right now, an amazing building is taking shape. 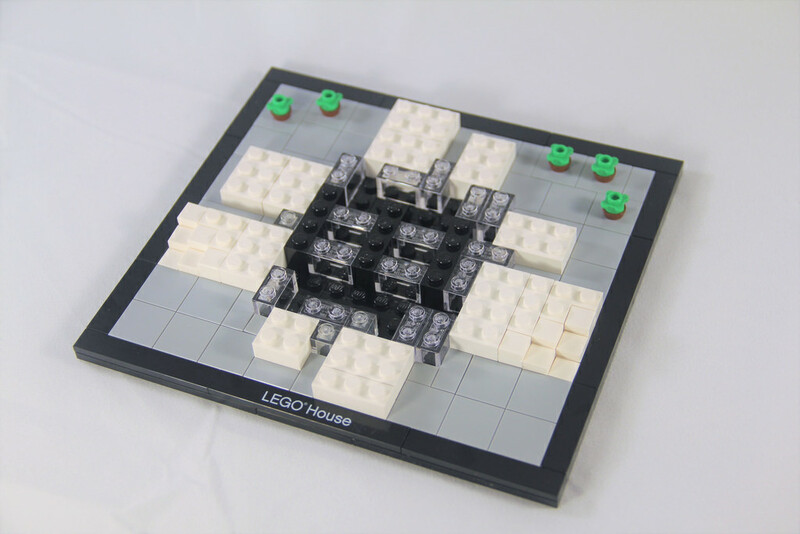 No, it’s not built of LEGO, but it is LEGO House. According to the website, LEGO House is a “23m tall, 12,000 m2 hands-on minds-on experience centre where LEGO fans of all ages are invited to discover the magic behind the LEGO brand, experience the LEGO story and be inspired by all the endless play and learning possibilities with the LEGO brick.” It sounds amazing! It’s got six different experience zones, three restaurants and a state of the art LEGO retail store. It’s going to be the only one in the world, and I’d love to visit it one day. 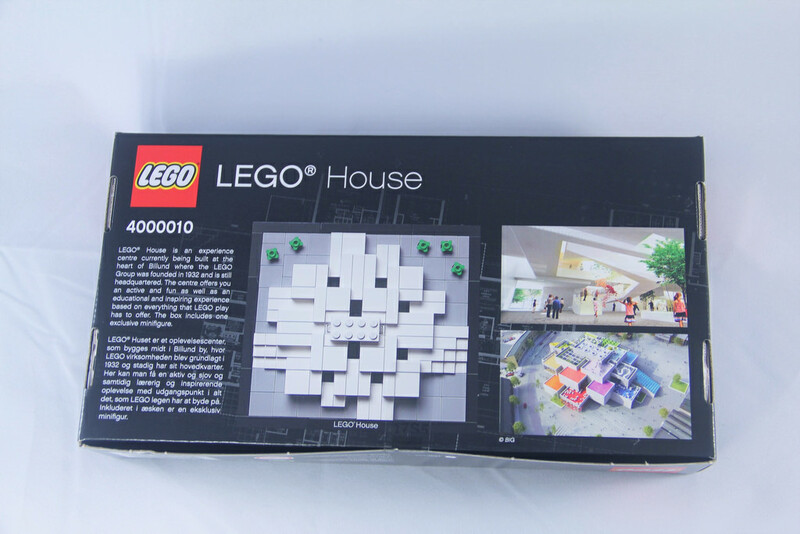 To promote the building, a special exclusive LEGO set was released in 2014, but these weren’t available everywhere – only the shops around the construction site of LEGO House had the exclusive rights to sell the set. Luckily for me, I had a contact who was in Billlund and kindly picked up a copy. (Thanks Craig!) It comes in a single LEGO Ideas or Architecture style box, which itself was quite stunning. 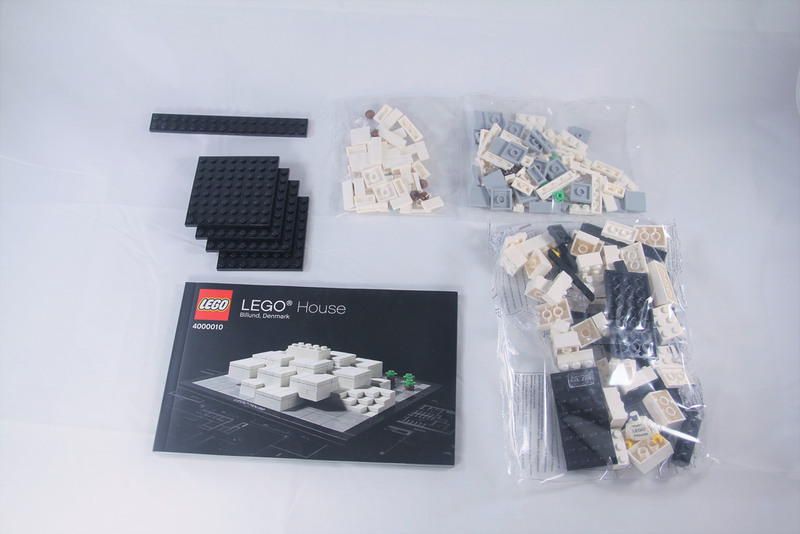 The back of the box shows a top-down view of the build, as well as some conceptual images of LEGO House, while inside are three parts bags, and 5 loose black plates, with an instruction booklet. 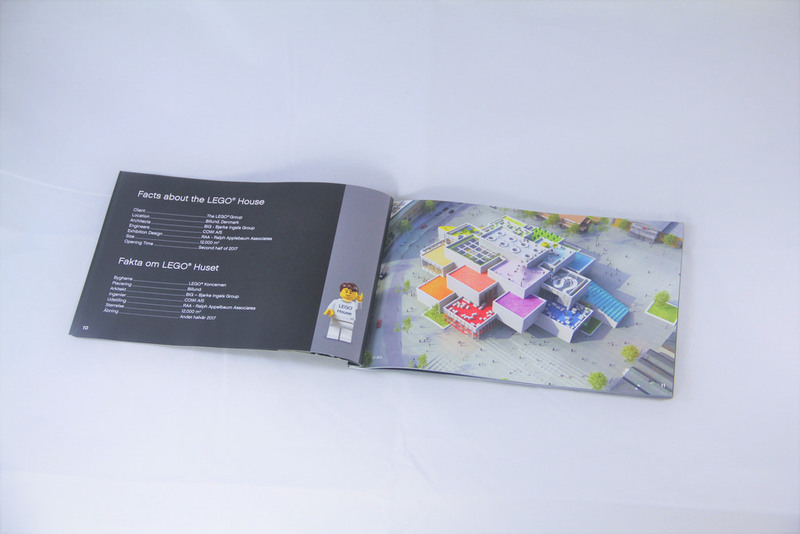 There’s information about LEGO House inside the booklet, before the fun begins. Elements for this set are, to be honest, pretty dull in comparison to other sets. I realise from the outset that this review isn’t going to be a huge score overall, but remember that this set is a special one, so that should hold some sway. That doesn’t mean, however, that there’s nothing exciting at all about the elements in this set. For one, there’s a minifigure included. 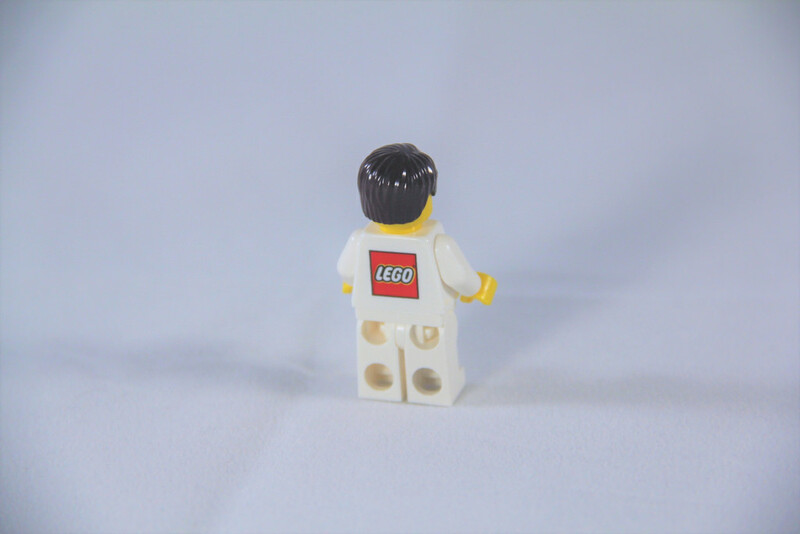 He’s got a special printed torso, with LEGO House on the front, and the LEGO logo on the back. Sure, he’s not to scale by a long shot, but it’s great to get a special minifigure once in a while. 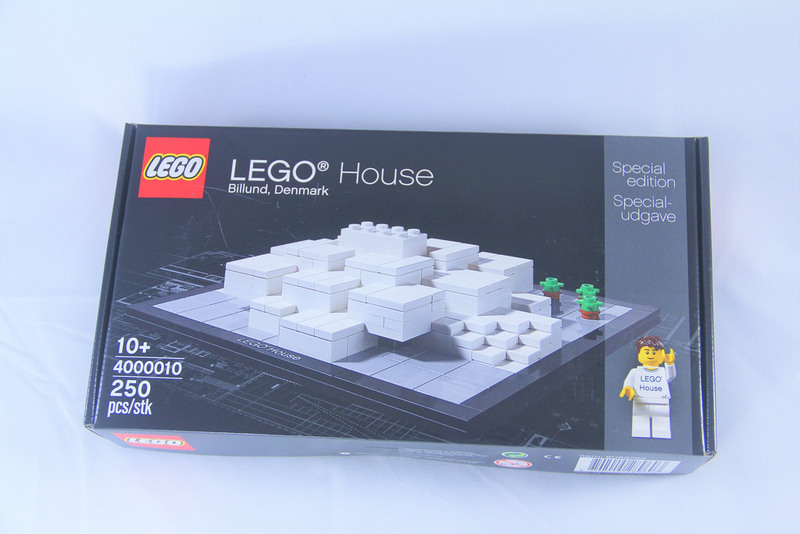 There’s an abundance of white bricks and white tiles of various lengths, as well as a stack of clear 1×2 bricks, light grey tiles, and the special printed 1×8 black tile with LEGO House printed on it, but there’s one element in particular that was a new introduction in 2014, and it’s a very surprising one – the clear 1×1 tile. The standard spares are always chock full of 1×1 tiles in various colours, but LEGO had never produced a clear 1×1 tile until 2014. It’s been seen in 13 other sets since then, but not before this set had them. There’s the three that are used in the build, and a spare. By now, this is probably not really exciting, as there are plenty of other popular sets that include them, but back in 2014, this was a big deal. There’s absolutely no play here at all. None. Nada. Zilch. Zip. Zero. It’s a display piece, pure and simple. The build process for this set is about as simple as you can get. All studs on top, nothing special technique-wise at all. You start from the ground up, building the base as you build the building for the first few steps. It’s as simple as floor by floor. The most interesting section of the build is probably the first floor sections, where four individual modules are created and added on, all with an overhang. Everything is then held together by the final 2×4 white brick at the very top. 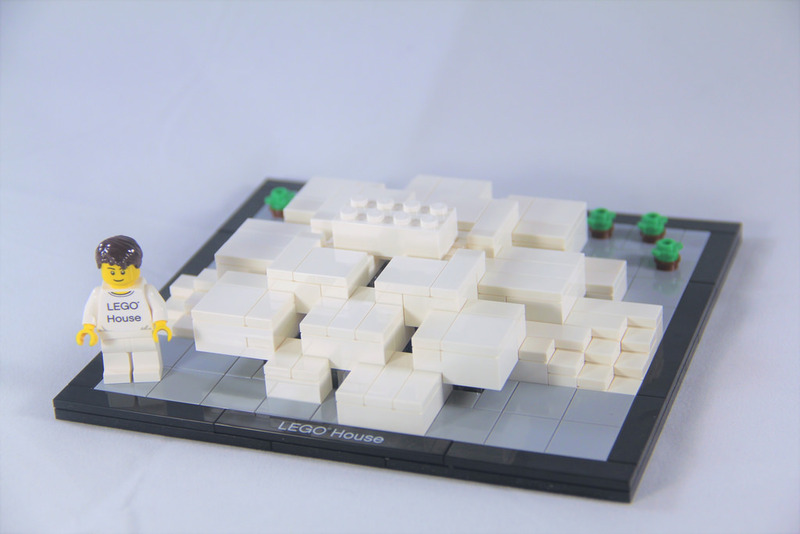 The footprint of the model ends up at 18×20, with very minimal studs visible – the 2×4, and the tiny trees, and that’s it. It’s strong, but over very quickly. While this has a similar appearance, in both box and set, to an Architecture set, because there’s no actual real life counterpart (yet), that’s where the Architecture theme similarities stop. The conceptual illustrations all show a fair amount of colour, and yet this model is completely white. 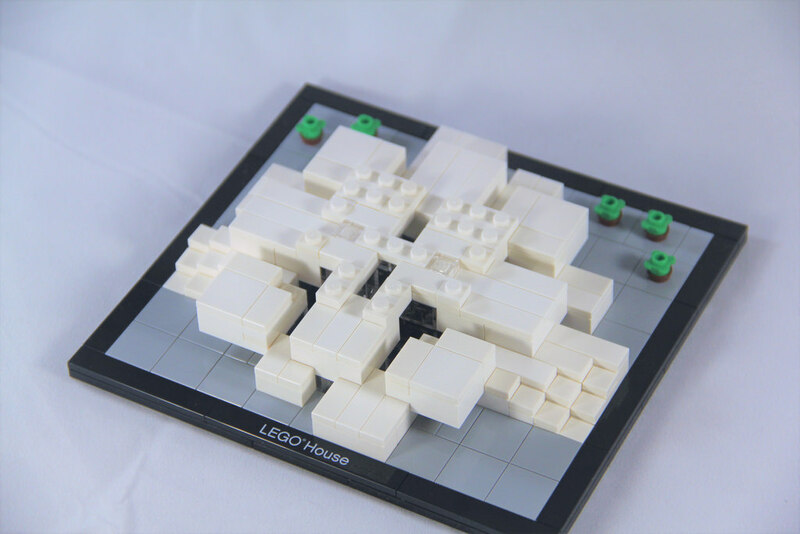 ​I like it, though, as it looks like a plaster model you see in architecture firms, or movies – “What is this, a LEGO House for ants!?”. The good thing about this model is you get a bit of a better understanding of what the actual building is going to be like, even if you never get there in person. For instance, it’s not a solid building. The centre of the building is hollow, with an atrium style opening in the centre of the ground floor. It’s also symmetrical, and not, at the same time. The bottom floor isn’t but the 1st and 2nd floors are. I like the little pops of green from the trees. It breaks it up from the monotonous black, grey and white. This is the sort of set that will draw a little interest, especially if it’s lined up with other Architecture sets – it will test the geography buffs – “I know these buildings, but what’s that one?” It’s very unique. I paid AUD$40 for my copy, and secondary markets (the only place you can get a copy, if you’re not able to get to Billund) will see you paying anything between $40 and $80. Based on what I paid, the cost per element is around 16c. It’s not cheap, and the elements included are by no means rare or exciting, so value for money here is low. What will get people to change their minds is the collectibility. Not only is this a special limited edition set, available from only one small selection of shops in one town in the entire world, but it’s a LEGO rendition of a building that should look like it’s built from LEGO, and with a limited edition minifigure. Collectibility for this set is very high, it’s what got me over the line to purchase a copy myself. Sure, the elements are bog standard, aside from a tiny percentage, but saying you’ve got a copy is worth the cost. Ok, the overall figure is not good, but bear in mind that this set was never meant to be a playable set. Take it how you want, but I was still pretty chuffed in being able to own a copy. It’s certainly unique! Next week I’ll be looking not at a set, but at another book by DK Publishing – 365 Things To Do With LEGO Bricks. It looks good so far, but you’ll just have to wait until next week. 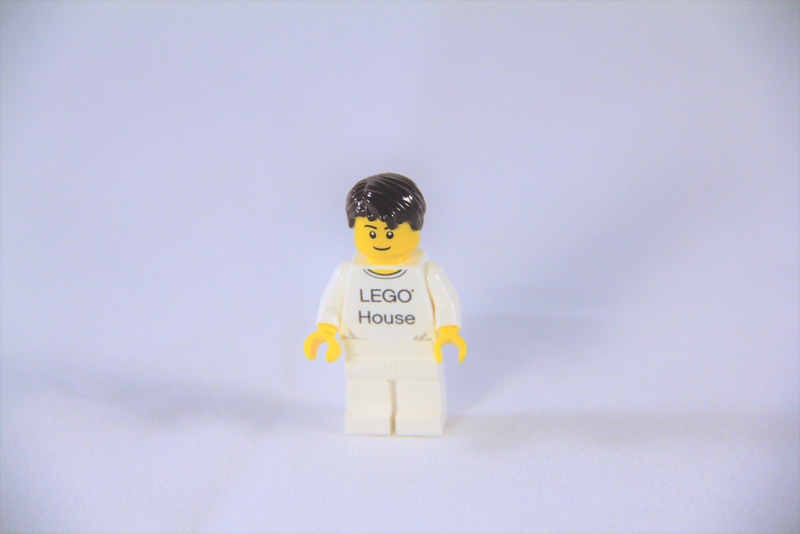 Have you secured a copy of LEGO House? Let me know in the comments.